But today's match is in no way a wishwash. 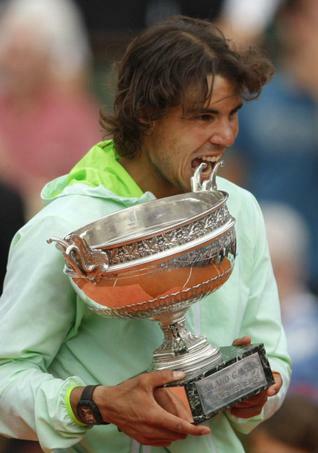 One, because Rafa was coming back to his favorite tournament after a disgraceful loss last year. Second, it was a rematch of last year, where Soderling literally decimated Rafa and the world thought that a clay court pretender had finally arrived. After a blinding 2008, which had the Olympic Gold for Nadal as an icing on the cake, and a blistering start to the 2009 season, all of 2009 was a bad year for Rafa, both professionally and personally. Tendinitis and his parents' divorce managed to hurt the muscled man from Majorca enough to turn his game on a downward spiral! A man who perhaps never gets ruffled by anything on court. Or else how could one explain his victory from the 'baselines' at Wimbledon 2008? And here he was, fighting all those ghosts of the past year, to put to rest thoughts about whether the pretender had arrived! I can only imagine the emotions that gripped Nadal, while entering Philippe Chartrier. Time to avenge last year's loss? Time to reclaim what had been his for over four years? Time to get back to the world? To date, the French Open perhaps was the last place he ever had to prove a point, although not this year. The records and stats in his favor may not be staggering yet, at least not as much as those of Fedex, but an imminent No. 1 ranking, 5 victories on clay, just one short of all time great Bjorn Borg. And he just turned 24! I am sure if he were to capture his emotions on canvas, the outcome would be psychedelic to say the least. And the setting was magical. The sky was overcast, in a typical theatrical Hindi Movie style; with perhaps just lightning and thunder missing! And the symmetrical 6-4, 6-2, 6-4 victory was pure poetic justice.